Sweet, tangy BBQ sauce with chicken, red bell pepper and gooey cheese make up this ultra-fast weeknight meal that can be ready to serve in 15 minutes. Now who doesn’t like that? 1/3 cup cooked chicken (I like to use rotisserie for a quick meal) – could use beans for veggie-friendly! 1. In a large skillet, heat oil/butter over medium heat. Saute red onion and bell pepper until crisp tender, about 3 minutes. Spoon veggies into bowl/on plate and set aside. 2. Working two at a time, place two tortillas in the heated skillet (no need to wash out since it already has oil/butter in the pan). Sprinkle shredded cheese and a drizzle of BBQ sauce over the surface of the entire tortilla and let cook for 30 seconds. 3. Then add 1 1/2 Tbsp chicken, 2 Tbsp onion-bell pepper mixture, a sprinkle of fresh cilantro on one half of the tortilla. Let cook for one or two minutes or until cheese is completely melted and tortilla is slightly crisp, then fold the other half on top of itself. Remove from heat and cut in two pieces (optional). 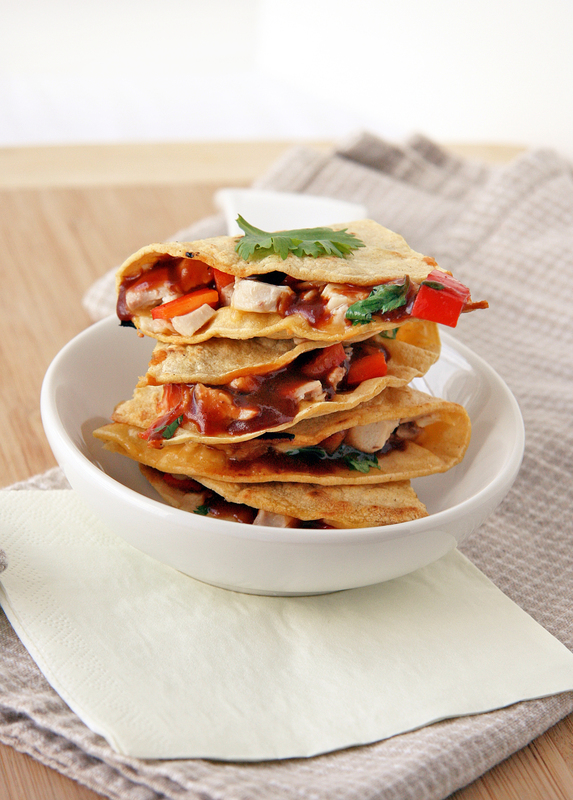 Repeat with remaining tortillas and filling and enjoy! Oh wow… these look delicious! 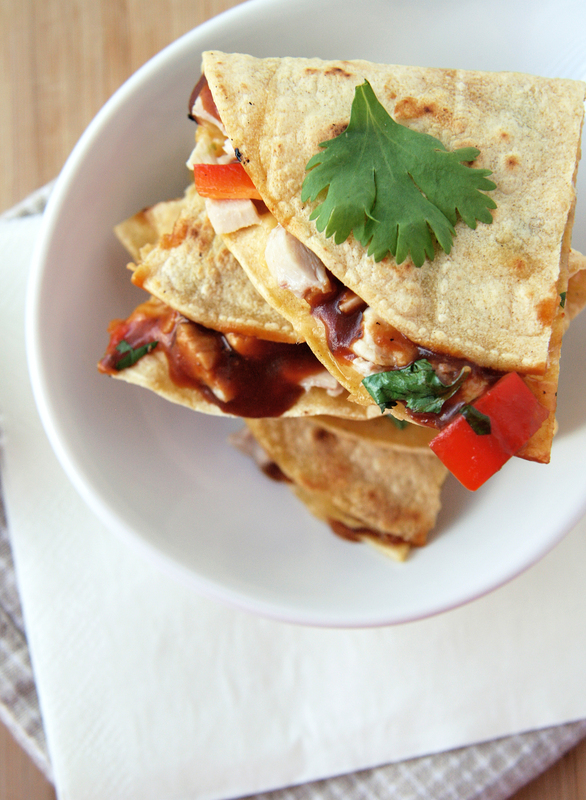 We were going to make another dish with chicken and red bell pepper tonight for dinner but I think we may need to switch and make these quesadillas instead! I hope you aren’t disappointed! 🙂 We sure love these at our house! Easy is exactly right! Turkey would be delicious in it, or maybe even beef if you eat red meat? I got this in my inbox this morning and just had to make it. DELICIOUS. Your recipes have never let me down. Thanks for sharing! SO glad you enjoyed these too! 🙂 And thank you for all your sweet comments! I made these tonight and they were awesome! I actually posted photos of my quesadillas (and gave credit to Natural Noshing) on my blog. Thanks for the great recipe!! YAY! Thanks so much for the thoughtful mention, yours look DELICIOUS! I’ll have to find green chile corn tortillas and make more, that sounds lovely! Mexican food = love! Another reason why you rock – you love Indian food AND Mexican food —- YUM! Hope you enjoy these sans the meat!